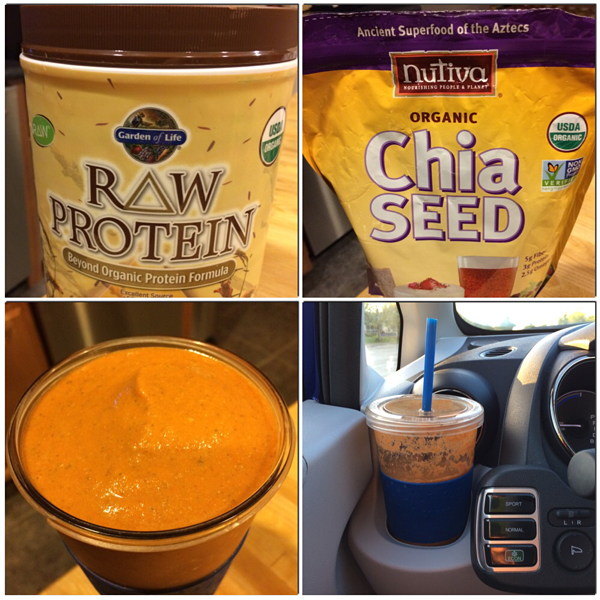 It’s been awhile, so I figured it’s time to participate in What I Ate Wednesday! 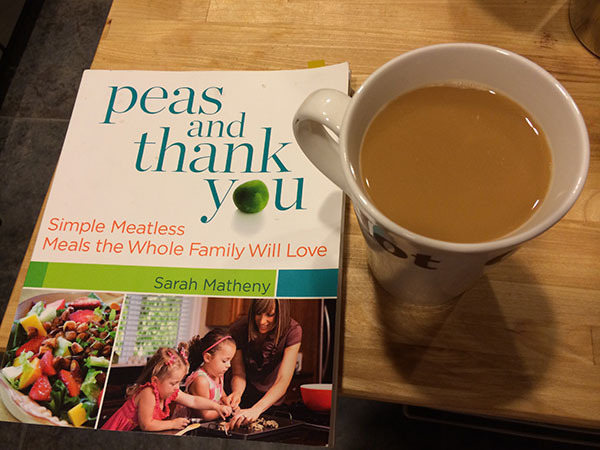 I started the morning with 2 cups of coffee with almond milk and NuNaturals powdered stevia while I flipped through Peas and Thank You for recipe inspiration for hubby’s birthday celebration this weekend. Mornings tend to be a little hectic for me lately as I feed three hungry dogs, give one an insulin shot, clean up messes, get ready for work, pack a gym bag, and make a smoothie to dash out the door with at 7am. I keep reminding myself I should get up earlier to have more time in the morning and sometimes I do, but that’s been tough lately. This morning I made a monster smoothie to go with Garden of Life’s Raw Protein powder, Nutiva Organic Chia Seeds, frozen banana, orange, carrots, ginger, and kale. 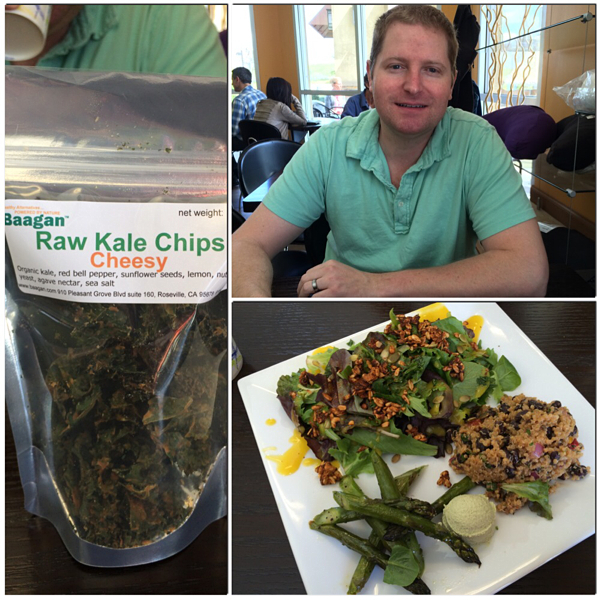 After a crazy morning at work, I met hubby for a relaxing lunch at Baagan and got kale chips and the salad trio plate with a tasty black bean quinoa mixture, asparagus with a creamy cilantro dipping sauce, and salad with mango jalapeno dressing. 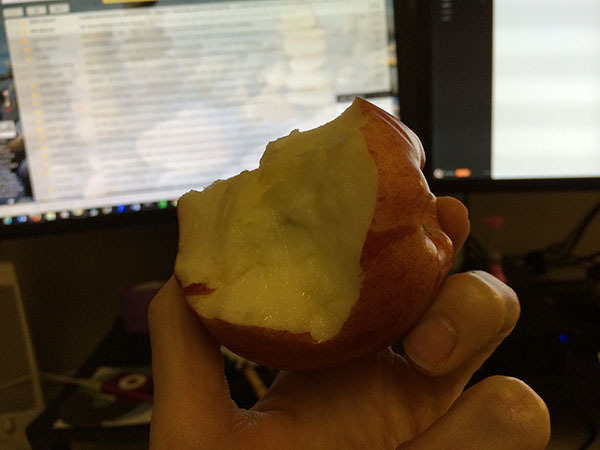 I had an organic apple for an afternoon snack, I take apples into work every day for a snack either before or after lunch. After work I ran by Whole Foods to grab recipe ingredients for the weekend and hit the salad bar for a simple salad for dinner with arugula greens, black beans, broccoli and plenty of other veggies. It was not a cheap day for me, unusually expensive in fact. My normal weekday lunches are leftovers and dinners a simple recipe. But the last few weeks have been a little crazy and I was ready for simple convenience today! Yum! I love kale chips. 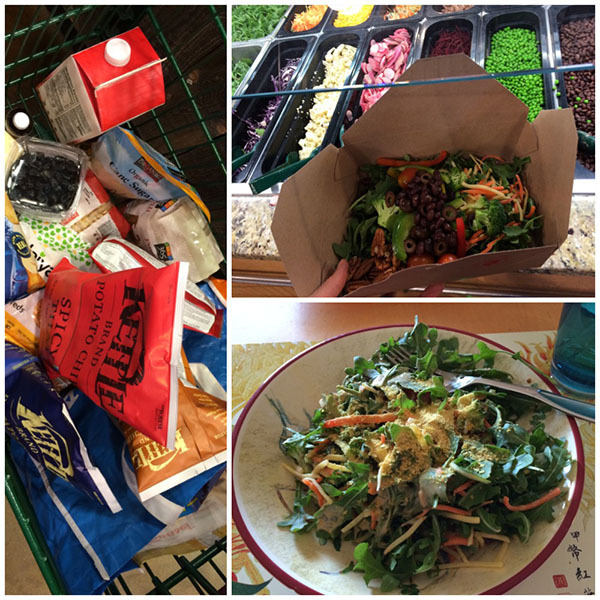 Is that nutritional yeast on your salad? That salad looks delicious. It’s funny how you can completely transform the way you look at food once you start to learn more about healthy eating. I used to hate salads! Now I love them and have them a couple of times a day. Yeah, I add nutritional yeast to salads a lot for a little added protein and b vitamins. So true on salads, they’re are so many flavor combo possibilities that they’re not boring at all! I really enjoyed your What I Ate Wednesday! LOTS of great stuff, here! The shopping haul looked cool, too! Thanks, I need to remember to participate in it more. :-) Shopping at Whole Foods is too fun and there were a lot of splurge vegan foods in the cart for hubby’s birthday.